alhambra lamp table. granada furniture. high end furniture. Mudéjar style of the Alhambra Palace in Granada was the source of inspiration for the Alhambra Lamp Table. The Mudéjar style, a symbiosis of techniques and ways of creating architecture resulting from Muslim and Christian cultures living side by side, emerged as an architectural style in the 12th century on the Iberian peninsula. Mudéjar did not involve the creation of new shapes or structures, unlike Gothic or Romanesque, but applied the elements of Islamic art and architecture to medieval Christian architecture. Even after Muslims were no longer employed in architecture, many of the elements they had introduced continued to be incorporated into Spanish architecture, giving it a distinctive appearance. Such Islamic influences included ancient Arabic calligraphic scripts, Kufic and Naskhi, which follow repetitive rhythmic patterns. These rhythmic repetitive patterns are replicated in the legs of this table. The style was widely popular during the Reconquista, the reconquest of the Iberian Peninsula from the Muslims by the Christian kingdoms. With this historic background in view, Shah Gilani, ASFD, designed the Alhambra Lamp Table for use in eclectic residential and hospitality interiors. Robust metal construction of the table base ensures stability even with its heavy glass top in place. 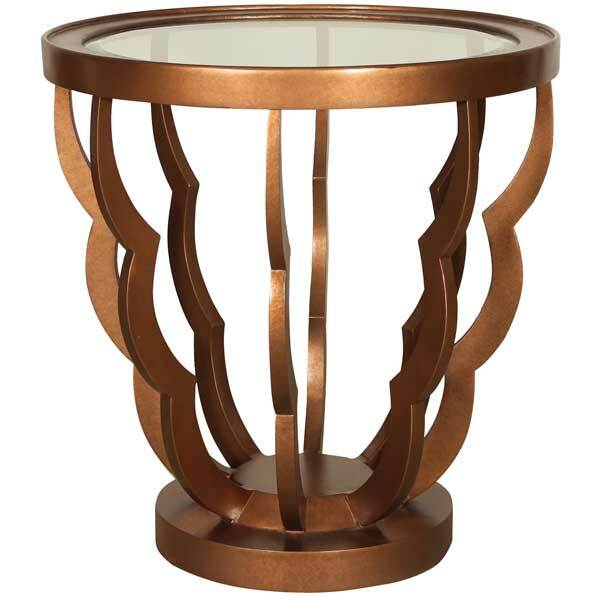 Its understated elegance allows this exquisite side table to be used in both casual and formal settings. It is offered in a variety of finishes. Custom sizing is available.